Its that time of the year. The Google I/O, one of the largest tech gatherings in the world. So big that not only at the huge amphitheater at Mountain view California, thousands of tech enthusiasts gather to see whats latest by Google at extended events around the world. In 2017, the Google I/O event was live streamed as extended events in 534 locations globally. One such event was organized by Mobitel at Stein Studios with the participation of over two thousand tech gurus and geeks. Its back again and things will happen on the 8th of May at Stein Studios with the same glamour and glitz as last year. But this year Mobitel has tried to make things more interesting with blockchain. Remember in the last post we learnt the basics of the blockchain? Now it is time to see a real life implementation of blockchain in all its glory. Mobitel has applied the blockchain technology to the process of registration and approval for Google I/O extended 2018 just so that you can have a first hand experience on how blockchain works. This is a great opportunity to learn even for the novice on how a real life application on how blockchain works. In the last post we saw that blockchain is a distributed (stored in many many locations) immutable (cannot be changed) list of records. If you slow down and think a little you will realize that the registrations, ticket grants and such are all list of records with the participant details. For example the registration list is the list of participant details such as name, email, t-shirt size, food preference etc. Traditionally you can store this in a database or even an excel file without much problems. With blockchain, you store this list on the blockchain network. Any addition to the list is submitted to the network where it is updated. The list is publicly available and cannot be manipulated. Think of it like a distributed database which cannot be hacked. This is exactly how your registration details are stored when you register for Google I/O 2018 extended with Mobitel. Important thing to note is the registration confirmation link in Step 2 which is unique to your email. Pleasedo not share it with anyone else since this link is for one time use. If someone else uses your link for registration you will lose your chance to register. uPort app contains your identity in the blockchain network. For those of you who are familiar with blockchain, you might find the information on the screenshot 6 interesting. 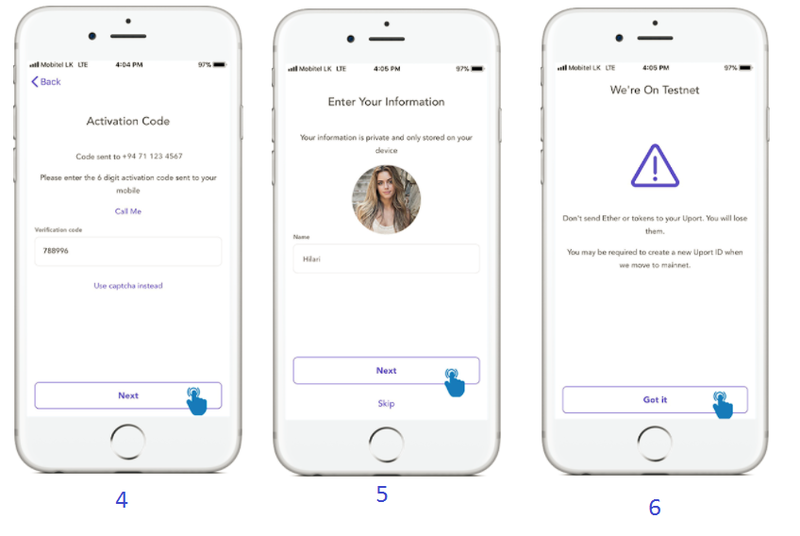 It indicates that the app works on a non-commercial blockchain network. To be exact, it works on the Rinkeby Ethereum test network. This is where your registration details are stored. Now that you have a way to interact with the blockchain world, it is time to proceed with the registration. Click on the link that you got in step 2 in the email and click on the ‘Complete Registration’ button. At this point you will be asked to login with uPort app. Open your uPort app and scan the QR code. You can find the QR code scan button on the upper left corner of your uPort app. 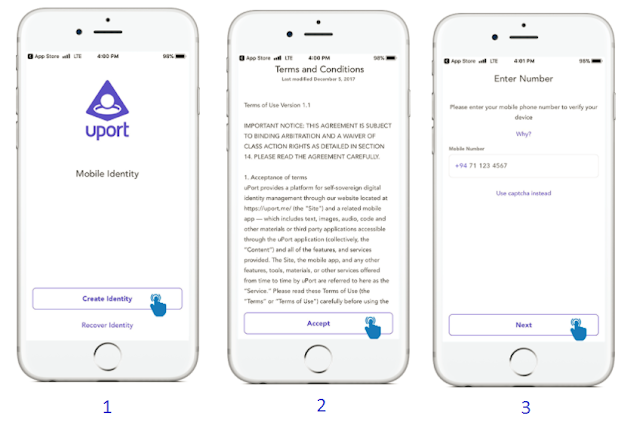 At this point your uPort app will request you to approve the login request with your identity in the blockchain network. After clicking ‘Continue’ you can view the details of your registration entry (You might need to wait a couple of seconds after scanning the QR code for the ‘Continue’ button to become active). Remember, your details have still not been submitted to the blockchain network. Now it is time to create your smart contract for the Google I/O registration. To do so, click the ‘Register button. Under your registration status, you can see a ‘View your contract’ button. Click on that and you will be redirected to etherscan.io where you can see your smart contract on the Rinkeby network. If you don’t speak geek, all this might sound gibberish to you. But hang on a sec, we’ll try our best to explain whats what. At the top you will see the transaction ID. You see every record added to the blockchain (always remember blockchain is a distributed list of records that cannot be changed) contains a transaction ID just like and entry ID. Sounds simple right? lets move on. Next is the transaction hash. This is one of the primary parameters in ensuring the fundamental immutable property in the blockchain. It is basically a hash of the transaction details. If you are ready to dive deep there is this great couple of videos by a gentleman called Anders Brownworth https://www.youtube.com/watch?v=_160oMzblY8 and https://www.youtube.com/watch?v=xIDL_akeras along with a web resource https://anders.com/blockchain/blockchain.html It will make your life easy in getting to learn about the blockchain. Next few details are specific to the Ethereum network and it is very difficult to explain without going too technical. We’ll try to have those debunked in a future blog post. However an interesting part is the last bit called ‘Input Data’. At the end you can see the actual record details of the registration. So it proves that your record is stored in the blockchain network in a fully distributed fashion. The record of your registration for Google I/O extended with Mobitel is now part of a distributed immutable list of records. Therefore there is no need to maintain a separate participant list for Mobitel. It is public and secure. You can use your uPort app to prove that you have obtained a ticket by pointing to the transaction of the ticket grant at the day of the event. This is a real life application of blockchain.